A 96-well format screening system was generated to quantify changes in nonoxidative glucose metabolism and oxidative pyruvate metabolism. D-Glucose uptake from the supernatant media was quantified by the glucose oxidase method, and l-lactate production of cells was quantified by the lactate dehydrogenase method applied on supernatant media. Mitochondrial membrane potential was quantified using tetramethylrhodamine methyl ester (TMRM) fluorescence, and reactive oxygen species (ROS) formation was determined by quantification of dihydrodichlorofluorescein fluorescence. Adenosine triphosphate (ATP) content of myocytes was determined using the luciferin reaction, and cellular respiration was quantified using commercially available, precoated microtiter plates. These six assays were used to determine the putative influence of organic solvents, namely dimethyl sulfoxide (DMSO), ethanol, methanol, and N-methylpyrrolidone (NMP) at concentrations of 0.01, 0.1, 1.0, and 5.0% (vol/vol), respectively, on glucose and pyruvate metabolism after 4 and 24 hours. In summary, all solvents induced significant changes in regard to one or several of the parameters evaluated, affecting cellular glucose uptake, glycolysis, mitochondrial metabolism, or oxidative phosphorylation. 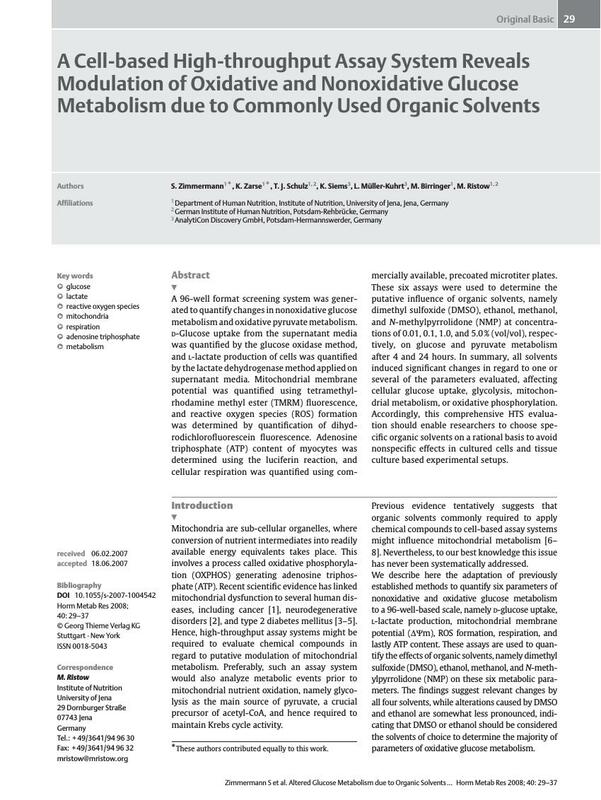 Accordingly, this comprehensive HTS evaluation should enable researchers to choose specific organic solvents on a rational basis to avoid nonspecific effects in cultured cells and tissue culture based experimental setups.